Wow, second blog on the spider bite! I may get a complete "from start to finish" out of this! Pop found a dead brown recluse in some laundry from the bathroom that I'd put in the laundry room. I'm hoping it's the one that bit me and I'm so glad it's dead! I read somewhere in all the research I've been doing on brown recluses and bites, etc., that each home in the USA has approximately 65 brown recluse spiders hiding in the baseboards, closets, etc. They like dark, closed-in, tiny places. The heat and sunshine are really horrible. Ten minutes in the sun and I am sick as a dog for several hours. I'm scared to say this, but I think it might be getting a tad bit better. Everyone that looks at my arm thinks it looks "a little" better. I'll take that! What little I slept last night I had horrible nightmares. Kept dreaming that the hard spot, which is "dead" white looking and actually feels "dead" came off somehow and I had one of those huge holes in my arm. I was SO relieved this morning when I looked at my arm in the mirror (since it's on the underside almost of the upper arm, a mirror is the only way I can actually see it). I'm so surprised. I've been posting on Facebook about my brown recluse spider bite. Someone suggested I blog about it. I thought, "What a good idea. I really like to whine when I feel bad." Went to Google, typed in free blog sites and up popped Blogger and said "Sign in Dummy, you already have a blog." I'd completely forgotten about having one. Duh! Thursday, July 1, 2010 -- a date that will live forever branded in my brain -- was like any other day in my life. Quilted a while when I got up (I don't work on Thursdays and beginning July 9, I don't work on Fridays either). I'd signed up for a photoshop workshop at Ole Miss, sponsored by the MS Press Association. Great workshop! I love classes of any kind. Dressed for the workshop a little bit better than I normally do -- instead of raggy t-shirt and jeans, went for the decent regular shirt and "dress" jeans. The minute I got home from the workshop, I headed straight to change clothes. You can only wear decent clothes (and undergarments!) so long. Pulling my shirt off, I thought I scratched my arm, apparently a pretty good scratch, as it was really burning. I looked at the "scratch" in the mirror and it looked more like a snake (or vampire) bite. 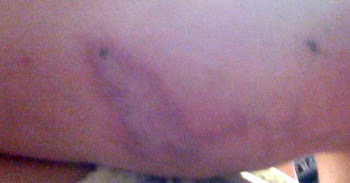 Two little holes, on the side of my upper arm, that was already swelling and turning red. Pop, otherwise known as Butch or Doyle -- and my husband of 40 years! -- came in to look at my arm when I called him. First thing he said was "spider bite." I can't repeat the first thing I said. Sunday, the Fourth of July, was another day of the same -- except for the chorus of "Go to the doctor!" that I got from everyone at church. By Monday, after spending the day at work in pain and agony, and listening to everyone say, "GO TO THE DOCTOR!" I went. Tried to go to the Urgent Care in Oxford -- I had called to see if they were open on the Monday after the 4th of July. They had a little recording that said, "Today is Monday, July 5, our hours are 8 a.m. to 7 p.m. and the doctors today are...."
Well, at 5:45 p.m. they were closed! So, feeling slightly foolish for going to a "real" ER for something as dumb as a spider bite, I drove on around to the hospital in Oxford. After a not-very-long wait, the nurse called me to triage. She looked at my arm, said "Come on, let's go in here and see the doctor." In just a few minutes a guy doctor walked in. (I have a girl doctor and a lot of Pop's doctors are girls. I guess I've gotten used to girl doctors. I do like 'em!) Anyway, the guy doctor walks in, introduces himself, looks at my arm and says "That looks awful!" At Subway, Mere wanted a foot-long sub -- Italian, with olive oil and red vinegar, black olives, etc. Sometimes I'm amazed at food choices. I've have choked to death on that when I was 14. Back then -- give me a Big Mac! Mere ate every single bite of that foot-long sandwich! At almost 5 feet and about 85 pounds soaking wet, the sandwich was almost bigger than she is! But I digress -- as we say in Sunday School when we get off topic -- which we do frequently -- "Back to Jerusalem!" Tuesday my arm hurt a lot and I itched a lot and just generally felt like a slug. My arm looked worse than it had, so Wednesday, I went to see my doctor, Cassandra Hawkins. (Great doctor! And my 12-year-old granddaughter Remy adores her!) Anyway, she looked at my arm, along with some of the other staff and they all agreed it looked really disgusting. :) She gave me a Roscefin (can't spell that one) shot -- a very heavy-duty antibiotic and some fantastic itch cream. I'd been clawing at my arms, thighs and the top of my feet since the spider bit me! Whatever this cream is, it's worth it's weight in gold! (mometasone furoate cream). By the afternoon, I wasn't itching and my arm was just a dull ache. Hah! All the stuff I'd been reading on the Internet was crazy! This wasn't going to be bad at all. I was nearly recovered already. Came home, did some laundry, ate supper and while I was eating the wonderful burger that Pop had cooked (he's a great hamburger cooker!) the muscles under the "bite site" began to spasm and act like they wanted to have charley-horses. Not long after that, I was laying (lying?) across my desk in agony. Felt just like someone with a burning, blazing hot hand had reached up through my armpit (yes, it's gross, but...) and ripped out all the muscles and stuff. The pain was excruciating. I walked around the house a bit, crying and feeling pretty sorry for myself. This was the worst pain I've ever felt! It was SO horrible. I took one of my heavy-duty ibuprofen that I have for my arthritis and after 30 minutes or so, the pain hadn't diminished at all. I called my pharmacist (Tim Liddy, a really good guy) and he said I could take one of Pop's Lortabs with my ibuprofen. They were different and did different things and I wouldn't overdose on that. For the moment, I am calm, not sobbing and almost upright in my chair. We'll have to see what tomorrow brings. I had Mere take a picture of my arm the other day. I'll get another one tomorrow and post them here. They are gross though! One last thought -- the ER doctor said that only about three to five percent of brown recluse spider bite victims get that horrible huge gross hole. I am steadily praying that I am in the 95 percent, who just suffers agony, but not the grossness! First, to my brother: Yes, procrastinator is spelled right! (That's an inside joke and I'm only gently hinting that he can't spell). That's okay though. He is a thoughtful, prolific blogger (AmeriDan in my blog list). I guess I have to poke fun at him for spelling, because he pokes fun at me for forgetting to actually blog on my blog. Hmmm... what to update first? Sewing room? It was beautiful while it lasted. And it is much easier to clean now, than before. However, at the moment, it's in the "yes, I'm working on four projects at the same time" mode. So, it ain't what you'd call "tidy." However -- it is still functional and I can work on four projects at the same time! I'm working on my Dear Hannah quilt again. I hate when I'm distracted from that because once you drift away from anything, it's hard to drift back. But! I'm also working on a Round Robin we did on the Dear Jane website, a queen-sized Harvest Home quilt block of the month at my quilt guild (Piecemakers in Oxford, MS) My friend at work Beth and I are working on a graduation quilt for one of our best friend/co-workers' daughter, who, although we never gave her permission to get past 7-years-old, has managed in the past few years to grow into a wonderful, talented, sweet and level-headed high school senior. Jessica should still be holding my hand when we walk to the Post Office, but since she has her own new car this year would probably laugh at me for 1. trying to hold her hand, 2. walking anwhere. When it's finished, hopefully, I'll post a photo. It's going to be gorgeous! And extra-long since our drop-dead gorgeous Jess is 6 ft. tall. I also made a Levi quilt! A dear friend's daughter had a baby, named him Levi. So, Levi had to have a Levi quilt. I'm going to attempt to post a photo. Meanwhile, like all the rest of us in the world -- I work (to make money to quilt). I come home, do the dinner bit and try to sew the rest of the night unless life interrupts me. But all is well. Paducah is coming! My boon traveling companion and the other half of my brain Jane and I are leaving Wed., April 23 for the mecca of quilting -- Paducah, Kentucky! I wish I had time to rest up for the trip. Unfortunately, the real world keeps sticking it's head into my life. Oh well. After several people asked, it finally occurred to me that I could add a link to The South Reporter. The "SR" is a small, weekly newspaper in rural Mississippi -- Holly Springs to be exact. Holly Springs is a beautiful little town, with 64 (trust me, they've been counted!) antebellum (pre-Civil War) homes. We have the requisite beautiful old courthouse on the square and three antebellum churches with Pilcher organs. Massive pipe organs! Absolutely fantastic sounding, they are all antebellum (of course) and lovingly and "religiously" taken care of. All the babbling above is leading up to the fact that I work at the SR; write a column and do about a 1,000 other things, along with Barry Burleson, the editor; Barbara Taylor, production manager and all around wonderful person; Beth Breithaupt, ad salesperson and the kindest person I know; Sue Watson is the most conscientous news reporter around and Fred Dee, or Mr. Freddie, ad salesman, is a true "grumpy old man." We often laugh and say "scratch Mr. Freddie's surface and underneath that grumpy old man exterior, you'll find an even grumpier old man!" But, he's our grumpy old man, and we all love him dearly. If you'd like to read my column (Close To Nowhere) it's in the editorial (or opinion?) section. I'm very proud of both the print and the online editions of "my" newspaper! I have achieved "floor!" My "new" sewing room actually has one! Most of my fabric is folded neatly on the new shelves. I've even made a baby quilt (just a drag-around with stippling -- one of the 2-hr. kind) But I actually found my sewing machine, thread AND scissors! I won't even mention what all I still can't find because I haven't unpacked the boxes with my sewing desk drawers "stuff." I just wish someone could tell me how I have more stuff now than I did when I packed it all. I had everything in the much smaller room and except for a few stray bolts of fabric, it all fit. I have boxes that I don't recognize. And I have enough batting to never have to buy anymore ever again. I think some of the stuff in here is related to clothes hangers -- they multiply in the dark! Meredith is very excited (11 yr. old granddaughter). She has her corner set up with her mother's sewing machine (she likes it better than hers, so she "borrowed" it) She has a thread rack on the wall, along with a light and horse calendar and some sort of note pad. She's working on her very own shelves that are so far still a mess, but she's really having fun sorting her fabric and gadgets, etc. I'm somewhat awestruck at the way my stuff is edging it's way over to her shelves though. Not only does my stuff reproduce in the night, it's learning to migrate. Just amazing! I'm very aware of the new Bratz craze. I have two granddaughters, 11 and 9. But Bratz will NEVER replace Barbie! I have a small collection of Barbies. About 20 assorted and then my Wizard of Oz collection. I also have a Wizard of Oz collection of Beanie Babies. And my sister Jackie, gave me a "Tin Man" for my birthday! He's made of cans and has an oil funnel for a hat and he is so cute! He's supposed to be an outside Tin Man, but I have him inside, where he really belongs! As I've worked on my sewing room I keep finding things I'd forgotten I had. I have some great fabric! And some wonderful books and magazines. I spent way too much time last night looking at some of my Martha Pullen Sew Beautiful books. I love christening gowns as much as I do my quilts! I finally managed to get a space clear enough near the wall to hang shelves and put my Wizard of Oz collection back up. I've missed them. Most of my Barbies are on my bookcase and didn't have to be put up, but my Oz collection was on a quilt rack that I'm moving. So... Glenda, Dorothy and friends were packed for a week or so. I really missed them! Now, they're hanging next to the Tin Man and about half of my fabric is neatly refolded and put on new shelves. ALL my quilting books, including my Martha Pullen books, fit on one of the bottom shelves of my new wire shelves. Whew, that was a sentence! The smaller room is now a quite cozy and attractive bedroom. Photos of that will follow as soon as I make one curtain and a table cover. 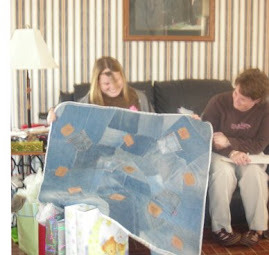 Levi's Mom, Levi's Grandmother and Levi's Quilt! I love my Barbies and Beanie Babies! I work at a rural newspaper (weekly) in the Deep South. I love my job about 75% of the time, which I figure is pretty good. I am a Methodist, attending a very small, rural, beautiful church near a lake, again in the Deep South. And I guess most importantly -- I have two wonderful granddaughters. They give me and their Pop great joy... Pop and I have been married since 1970. High school sweethearts. :) We have two kids, Our son Kris, 32, a computer whiz, who works with me at the newspaper and also maintains the paper's website; and Dana, a world class knitter, 36, and mother of the two best little girls in the world! She's also an RN in the recovery room at a children's hospital.